Can a font make me popular? When Matthew Carter arrived for drinks at a private club in Leicester Square in May 2009, he was accompanied by his girlfriend Arlene Chung, and they started talking about films they might see together on their brief visit to London. Carter, a Brit long based in the US, had travelled from his home in Boston to see his children, and to give a lecture about revivals – the process of updating typefaces from the previous 500 years to suit today’s needs. He was such a popular draw that his talk had to be switched to a larger venue. The lecture was not difficult for Carter. Now in his early seventies, the subject had occupied all his working life. But the choice of movie was more of an issue. It wasn’t the subject matter as much as the accuracy – so often when Carter sees films he notices niggly things wrong with type. How could a story set in Peru in the nineteenth century possibly have a sign on a restaurant door that had been composed in Univers from 1957? How could the film Ed Wood, set in the 1950s, use Chicago, a font from the 1980s, as the sign at the entrance of a studio? And how did the props team of a movie set at the start of the Second World War get the idea that it would be okay to print a document in Snell Roundhand Bold, when Carter, watching in the multiplex, would recognise the face as something he himself created in 1972? Carter finds this sort of anomaly more amusing than annoying, but others take it more seriously, and bad type in film upsets them as much as bad continuity. On a section of his website called Typecasting, the designer Mark Simonson has set up a scoring system to denote just how badly filmmakers have got it wrong. He begins with Chocolat, the movie in which Juliette Binoche opens up a chocolatiere to bring joy to a sleepy 1950s French village. But the local mayor is no fan of type: pinning up a notice preventing the consumption of all but bread and tea during Lent, he has jumped forward a couple of decades to select a typeface (ITC Benguiat) not made until the late 1970s. Inevitably, this sort of thing happens all the time. The Steve Martin filmDead Men Don’t Wear Plaid, set in the forties, gets three out of five stars for historical accuracy – shame about the use of Blippo from the 1970s for the cruise brochure. The Hudsucker Proxy, directed by the Coen Brothers, also gets three stars, despite its studied period feel (beatniks, hula hoops) being marred for type fans by a corporate logo set in Bodega Sands from 1991. LA Confidential (2-stars) fares worse, not least because the nameplate of Danny DeVito’s gossip rag Hush Hush looks suspiciously like Helvetica Compressed from 1974. Carter’s own taste is for suitability, and for meeting the expectations of his employers. He is not only one of the most highly respected type designers, but one of the few able to make a decent living from the trade. He is proud of a description in a New Yorker profile that tagged him as the most widely read man in the world. ‘A bit of an exaggeration,’ he reasoned, ‘but it got people interested.’ Carter is also one of the most eloquent exponents of his craft. He looks a bit like his type, a classicist with a ponytail. He is the creator, notably, of Verdana, whose adoption by Microsoft has given it huge reach; of Georgia, the most legible and adaptable screen font; Snell Roundhand – based on an eighteenth-century calligraphic style, very festive, good for ironic party invitations; Bell Centennial, designed for the A.T.&T phonebook; ITC Galliard – a revival from the sixteenth century, tall and airy; and Tahoma, which, in its Arabic and Thai versions, is used by IKEA in place of their regular font – Verdana. The calligrapher Gunnlaugur SE Briem has described Bell Centennial as ‘a bulletproof rhinoceros that could dance Swan Lake’, and the same could be said for almost all of Carter’s work. There are at least twenty other Carter fonts, and his clients have included the New York Times and the International Herald Tribune, Time and Newsweek, the Washington Post and the Guardian. Beyond this, his work is on almost every computer in the world, and on perhaps half the western world’s advertising. Occasionally people will ask Carter, ‘What typeface should I choose if I want to be really friendly? Can a font make me popular?’ He tells them he doesn’t know, that he’s at the raw material end of this, and that it’s all subjective anyhow. And it’s too easy to say heavy bold gothic types are serious, gloomy and sad, while light, flouncy, ornate ones resembling human script are optimistic and joyous. He has learnt over the years that there is truth in all of this, but he has also learnt it is easier to say what works than why. Good type is instinct born of experience. 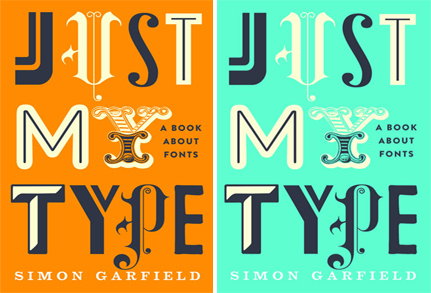 Carter’s life in type is unusual and instructive. He has worked in three key areas of the craft. His father was a typographer and historian, and he helped find his son an unpaid traineeship at Enschede, a leading bank note and type foundry in the Netherlands since the beginning of the eighteenth century. Here he learnt to become a punchcutter, and the process of cutting letters in steel taught him about the beauty of the alphabet. Carter then returned to London, and found there wasn’t much demand for skills rooted in the 1450s. So he began to paint signs, another archaic art. At the beginning of the 1960s he went to New York, and his journey into modern typography began. (Technically speaking, Typography is concerned with the appearance of type on a page or screen, while type design is concerned principally with the form of the letters.) After a while he was offered a job at the Mergenthaler Linootype Company in Brooklyn, the leading supplier of typesetting machines, and he set about improving their type library. His subsequent career took him naturally into the new processes of phototypesetting and designing for the computer. In 1981 he co-founded Bitstream Inc, the first significant digital type foundry, and a decade later he left to form Carter & Cone with his business partner Cherie Cone. It was here that he was commissioned – newspaper by newspaper, typeface by typeface – to establish the new look of much of what we currently read in print and online. Businesses and institutions employ Carter because there aren’t many font designers who have such an intricate knowledge of type history. For a man specialising in revivals this is obviously a prerequisite – and it is an attribute often lacking in the generation that followed him. Computers have obliterated the manual labour of casting letters by hand, but it is not just the craft that has disappeared; it may be the rounded worldview that such craft brings. Carter says he once went to a fair where someone was offering a poster from the 1840s advertising a forthcoming sale of slaves. He knew immediately it was a fake – its typeface originated from the 1960s. Once again, type can tell you much more than words on a page. SunriseDP is run by Neil Rees BA (Hons), a Falmouth College of Arts graduate with a wide experience in the publishing industry, alongside graphic and web design. SunriseDP offers an efficient, no-nonsense and affordable service for all your design and production needs, and particularly welcomes working alongside SMEs and new businesses. © Copyright 2019 Sunrise Design for Publishing.